Namibian independence attracts vast amounts of international aid, but development programs no longer benefit Ju/'hoan farms. 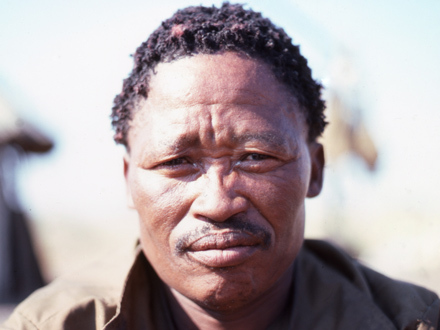 We witness the power of the "Bushman myth." This myth - a belief that Ju/'hoansi live uniquely in harmony with nature and are born to hunt. Promised great wealth, Ju/'hoansi vote to establish a nature conservancy. When their profits are a meager 75 Namibian dollars ($10.50 US) each, Ju/'hoansi ask, "Where is all the money going?" A Kalahari Family is a five-part, six-hour series documenting 50 years in the lives of the Ju/'hoansi of southern Africa, from 1951 to 2000. These once independent hunter-gatherers experience dispossession, confinement to a homeland, and the chaos of war. Then as hope for Namibian independence and the end of apartheid grows, Ju/'hoansi fight to establish farming communities and reclaim their traditional lands. Through depiction of their efforts of the Ju/hoansi to participate as farmers in the contemporary economy and advocate for their rights to do so, the series challenges stereotypes of primitive and unchanging "bushmen."